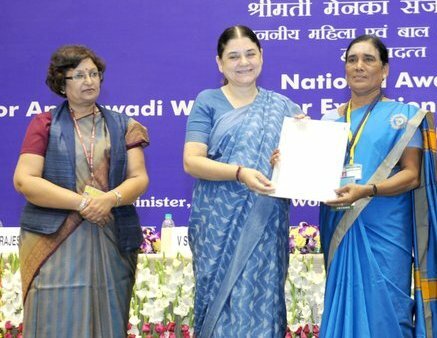 The Minister of Women and Child Development, Smt Maneka Sanjay Gandhi gave away National Level Awards to the selected Anganwadi Workers (AWWs) for Exceptional Achievement on the basis of their dedication and exemplary performances, at Vigyan Bhawan in New Delhi today. The awards were given for the years 2011-12, 2012-13 and 2013-14. Highlighting the importance of Anganwadi workers, Smt. Maneka Gandhi said that AWWs are the most important functionary at the grassroot level for delivery of services under the Ministry’s flagship programme of Integrated Child Development Services. Congratulating the award winners, the Minister said that they are a select few who have been chosen out of 24 lakh AWWs and are the pivot of the child welfare programme. Smt Maneka Sanjay Gandhi also announced that from this year, to motivate the Anganwadi Workers, it has been decided to revise the existing guidelines. Under the revised guidelines, 50% of vacancies in the posts of Supervisors would be filled up by promotion from amongst AWWs with 10 years of experience as AWWs and having the prescribed educational qualifications as per the Recruitment Rules for the post of Supervisor, the Minister explained. Accordingly, instructions have been issued to the State Governments. Similarly, 50,000 anganwadis are being constructed under the MNREGA scheme of Rural Development Ministry to provide a suitable centre from which the AWWs can operate, the Minister disclosed. The WCD Minister further said that the World Bank will now be providing funds for training of AWWs, and equipping them with tablets as well as weighing devices. NIPCCD (National Institute of Public Cooperation and Child Development) has been entrusted with the task of training the AWWs for which special training centres are being set up. Secretary, WCD Ministry, Shri V. Somasundaran, in his welcome address, explained that ICDS is the largest scheme of its kind in the world and caters to 10.2 crore children and women. It is important to add value to the scheme by adopting modern technology, he said, for which AWWs will be given tablets in a phased manner which will help to collect data on nutrition levels and store it centrally. This will facilitate the AWWs and help improve quality of their work, he said. In the current year, nearly 10,000 AWWs will be equipped with tablets and the remaining will be covered in the next 18-20 months. In order to motivate the Anganwadi Workers and give recognition to good services in Child Development and related areas, Government of India formulated a scheme for awarding AWWs at National Level and State Level in the year 2000-2001 for the first time under Centrally Sponsored Integrated Child Development Services (ICDS). Since then the scheme is being continued on a year to year basis. A total of 118 Anganwadi Workers have been selected for National Awards for the years 2011-12 (32), 2012-13 (32) and 2013-14 (54). These Anganwadi workers have been nominated by the respective States/UTs. The award at the National Level comprises of Rs.25,000/- cash and a citation. Selection of Anganwadi workers for the National Level Awards has been done out of State level awardees and their performance has been judged on the basis of their contribution to (i) Supplementary Nutrition; (ii) Child Care; (iii) Convergence with Health Department; (iv) Pre-school Education; (v) Nutrition and Health Education (NHED); (vi) Community Participation; (vii) Cleanliness & Hygiene; and (viii) Innovations. The Integrated Child Development Services (ICDS) Scheme is the World’s largest integrated scheme working for children in India since last four decades. Currently, the services of ICDS reach 1022 lakh beneficiaries, comprising of about 829 lakh children (0-6 years) and 193 lakh pregnant & lactating mothers. Successful implementation of ICDS rests on the commitment of the frontline functionaries i.e. the Anganwadi Workers, working at the grass root level on honorary basis.